For two decades, Dr. Danielle Ofri has cared for patients at Bellevue, the oldest public hospital in the country and a crossroads for the world’s cultures. 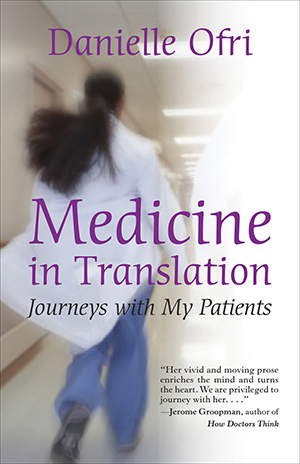 In Medicine in Translation, she introduces us, in vivid, moving portraits, to the patients she has known. They have braved language barriers, religious and racial divides, and the emotional and practical difficulties of exile in order to access quality health care. Sharing their journeys with them over the years, Danielle has witnessed some of their best and worst moments, and come to admire their resilience and courageous spirit. Danielle introduces us to her patients: Samuel Nwanko, who was brutally attacked by a Nigerian cult in his homeland and is attempting to create a new life in America; Jade Collier, an Aussie who refuses to let a small thing like a wheelchair keep her from being a homegrown ambassador to New York City; Julia Barquero, a Guatemalan woman who migrated to the States to save her disabled son but cannot obtain the lifesaving heart transplant she needs because she is undocumented. We meet a young Muslim woman threatened at knifepoint for wearing her veil, and the spitfire Senora Estrella, one of Danielle’s many Spanish-speaking patients, whose torrent of words helps seal Danielle’s resolve to improve her own Spanish, an essential skill in today’s urban hospitals. And so she, her husband, and their two young children and seventy-five-pound dog relocate to Costa Rica, where they discover potholes the size of their New York City apartment, a casual absence of street signs or even street names, tangy green-skinned limon dulce dangling in the playground, and sudden rains surging over the craggy edges of roadside ditches. Ultimately, Danielle experiences being a patient in a foreign country when she gives birth to their third child, a “Costarricense” girl. With controversy over immigrants in our society escalating, and health-care reform continuing to divide our country, Ofri’s riveting stories about her patients could not be more timely. Living and dying in the foreign country we call home, they have much to teach us about the American way, in sickness and in health.